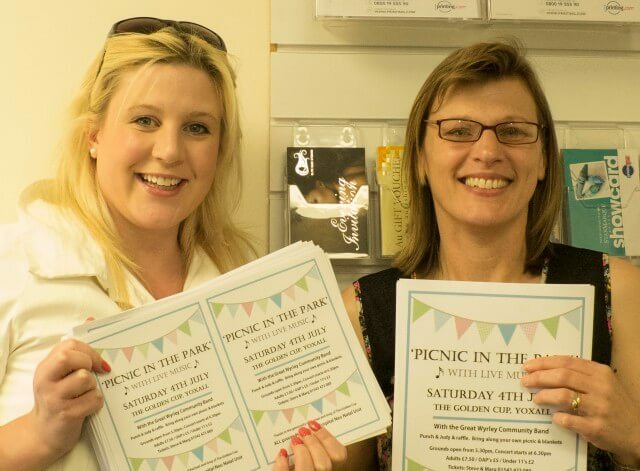 Get Ready to ‘Picnic in the Park’ on 4th July at The Golden Cup in Yoxall. On 4th July 2015 The Golden Cup at Yoxall will be hosting a ‘Picnic in the Park’. This is a charity event with all proceeds being donated to Burton Hospital Neo-Natal Unit. Marg and Steve Jackson of Benodet Breaks, plus other family members, are organizing the event. They wanted to offer their support to the Neo Natal Unit by way of a big thank-you to all the team there. One of their grand daughters was cared for at the unit for several months and all of the Jackson family received fantastic support from the hospital during this difficult time. The evening will be filled with entertainment for all the family. Live music is being provided by the Great Wryley Community Band (www.gwcb.co.uk) and everyone’s favourite puppet characters; Punch & Judy will be in action. The grounds open at 5.30 pm with the concert starting at 6.30pm. All you need to do is bring your own picnic and blanket to sit on. Raphael Design is delighted offer their support to this worthy cause by printing leaflets and posters to promote the event for free. Tickets are already selling well and the Jacksons are anticipating a good turn out on the day. If you would like more information about the event, wish to buy tickets or donate a prize for the raffle, please call Marg or Steve Jackson on 01543 473089.